Maria Topalovic (left) and Scott Peck (right) present Mark Tamminga (centre) and Joany Verschuuren (not pictured) with their award. Two of the Foundation’s most generous supporters were honoured at the HCA Conservation Awards on December 8, 2016. 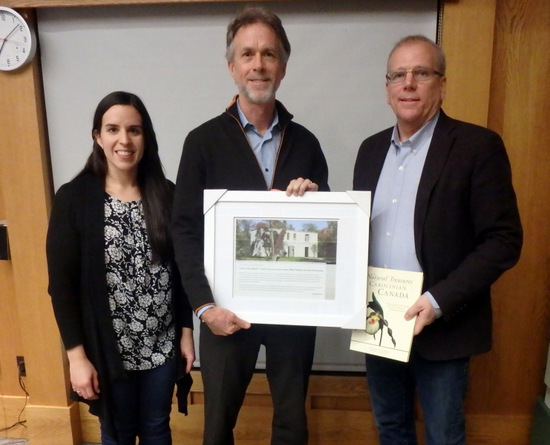 Mark Tamminga and Joany Verschuuren are long-time supporters of the Foundation and strong advocates for the conservation cause in Dundas and across the watershed. Mark and Joany’s support is much greater than their financial contributions. Their passion for conservation is infectious and has inspired gifts from enough of their friends to build a whole new community of supporters. Without that community, projects such as the Maplewood naturalization in the Dundas Valley CA, the Canal Park project and the Hermitage restoration simply would not have been successful. For their leadership and support, we cannot thank Mark and Joany enough.